The Battle of Lens (20 August 1648) was a French victory under Louis II de Bourbon, Prince de Condé against the Spanish army under Archduke Leopold in the Thirty Years' War (1618-1648). It was the last major battle of the war. Lens is a fortified city in the historic region of Flanders, today a major city in the Pas-de-Calais department of northern France. 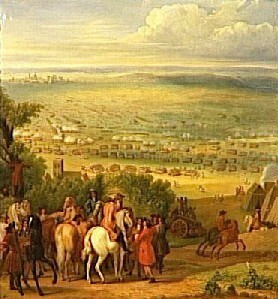 The city had been captured by the French in 1647. As France began to experience a rebellion of the nobility against the leadership of Cardinal Mazarin, known as the Fronde, the Spanish saw an opportunity to retake Lens and possibly gain ground. The Prince de Condé rushed from Catalonia to Flanders and an army was cobbled together from Champagne, Lorraine as well as Paris. The French army was 16,000 men (more than half were cavalry) and 18 guns. The Spanish army was larger, comprising 18,000 men (also more than half cavalry) and 38 guns. The armies drew up, but the Spanish were on high ground and Condé decided not to attack. As the French retired, the Spanish cavalry skirmished with the French rear guard and the engagement escalated until the armies were fully engaged. The Spanish infantry pushed back the French, breaking the Gardes Françaises regiment, but the superior French cavalry were able to defeat their counterparts and envelop the center. The danger to Dutch trade from the possession of Dunkirk by the French, the proposal of France to exchange Catalonia for the Spanish Netherlands, the declining health of Frederick Henry and his death in March, 1647, all contributed to stimulate the Dutchdesire for peace. Their cooperation in 1645-6 had been but slight; they now seriously prepared to treat. Though their Treaty of Münster was not concluded until January, 1648, it had been settled in principle more than a year before; and the year 1647 saw the French left alone in their northern struggle with Spain. In this year Louis de Bourbon, now Prince of Conde, was occupied in Catalonia, and Turenne was detained in Germany by the revolt of the Bernardine troops. France was exhausted, and the conquests of Dixmuyden in Flanders and La Bassee between Bethune and Lille were compensated by the loss of Menin, Armentieres, and Land- recies. In October Gassion was killed at the siege of Lens. In 1648 Conde, recalled from Catalonia, was nominated to the command in Flanders. A final effort was to be made to extort peace. Ypres had been taken and Courtrai lost, when in July he was summoned to Paris in consequence of the opening troubles of the Fronde. Once more at the front, and joined by Erlach with 4000 men from the army of Breisach, he advanced to the relief of Lens, which he found had already surrendered to the Archduke Leopold. Retreating towards Bethune, he enticed the Spaniards to leave their entrenchments, and a general engagement followed according to his desire (August 20). The French army, though its right wing at first was roughly handled, was completely victorious. Both wings of the Spaniards were driven in flight. Beck was wounded and captured, refused all assistance, and died of his wounds. Leopold and Fuensaldaña fled to Douai. The Spanish infantry, no longer maintaining the tradition of those who had fallen at Rocroi, surrendered in thousands. The Spanish loss was 8000 men, 30 cannon, all their baggage, and 120 banners. Six days later Paris was in revolt. Many years were to pass before a similar victory was gained by the arms of France.